Most children love singing and moving along music. Music not only brings joy to children, it also benefits children’s cognitive development. Music can then be used to motivate children to engage in learning activities. Children can be encouraged to participate in activities involving different sounds, rhythms and songs so that their body and mind can work together to learn new things effectively. Music helps children memorise information and it makes repetition less boring. The more you sing the song with your child, the more he will remember the information in the song. Use “hello” and “goodbye” songs to practise greetings. You may also combine the song “This is the way” with actions to practise daily routines with your child. If you would like your child to remember certain vocabulary, you can try to put your own words to a catchy tune such as “Twinkle, twinkle”. Children can involve more actively in a singing activity if it is creative and interactive. A dramatic pause is a good signal that it is the time for the child to either make a sound, do an action or fill in a word. You can start singing a song and stop abruptly. Your child needs to pay attention to where you stop at so that he can continue the song by adding what he thinks will fit, e.g. Old MacDonald had a farm, yee-ah yee-ah O and on that farm he had a [pause](animal name). Songs can be fun and useful for practising comprehension. After singing a nursery rhyme (e.g. ‘Humpty Dumpty’) to your child, he can answer some ‘Wh’ questions about the content, e.g. “Where did Humpty Dumpty sit?” If he cannot answer the question, you may sing the song with him again and stress or pause on the keywords to help him he listen for the answer. Simple musical instruments, such as drums, rhythm sticks and tambourines are good for playing at home. 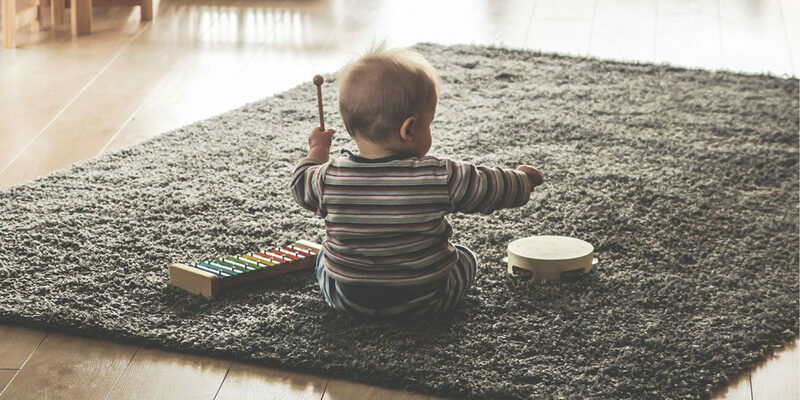 At the beginning stage, you can practise imitation and turn-taking skills using the instruments with your child. For example, you can play one beat on the drum and say “one”,then pass the drum to your child to play the same beat. To step up, you may play more than one beat, change the speed or volume of the beating to see your child’ response. Help your child indicate the changes (e.g. loud/soft, fast/slow). Use different instruments to develop their awareness of sequencing. For example, first hit the tambourine, then tap the sticks and last hit the drum. Making instruments is a good way to learn where sounds come from. 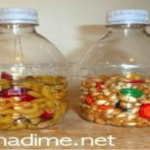 It is not difficult to get your kids to create their own musical instruments at home. To make a maracas, have your child put some rice or beans in an empty bottle then close bottle and the maracas is ready to go. You can also make music with water and water glasses. All you need is to fill 7 to 8 glasses with different amount of water, as different levels of water will give different sounds. 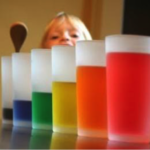 You and your child can then make your own song with these musical water glasses!